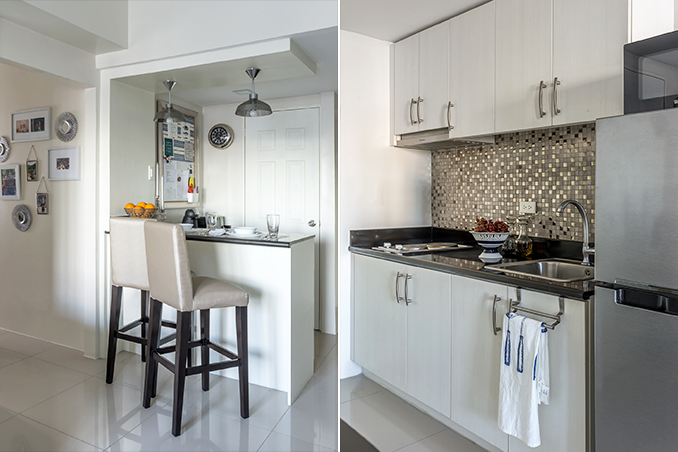 When Katrin Nunez and Raul Galang invested in two units in Makati, they asked Honey Mutia and Rosa Manduriao of Desaurum Co. Interiors to be in charge of the interior design. To create more space for the young couple, the first order of business was to combine the two units. Now that they had 48 square meters to work with, Honey and Rosa furnished the newly renovated one-bedroom condo with classic and timeless pieces in white, blue, and silver. Ready for your own makeover? Contact Honey Mutia and Rosa Manduriao of Desaurum Co. Interiors at (0999) 540-6313.